Biding their time through the winter, the leeks in my garden plot are ready for pulling. I’ve used one here and there, usually for adding to chicken or vegetable soup, but now the whole crop is ready to harvest. What to do with several dozen leeks? Leeks can be used in place of onions, of course. They are milder, sweeter than onions. 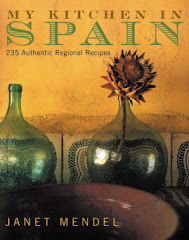 I especially like them with all things fish—sauteed in olive oil until melted into a thick jam as a bed for roasted salmon; simmered with white wine and scallops or mussels; fried to a frizzle as a garnish for grilled sea bass. Leeks, trimmed of outer leaves and tops. 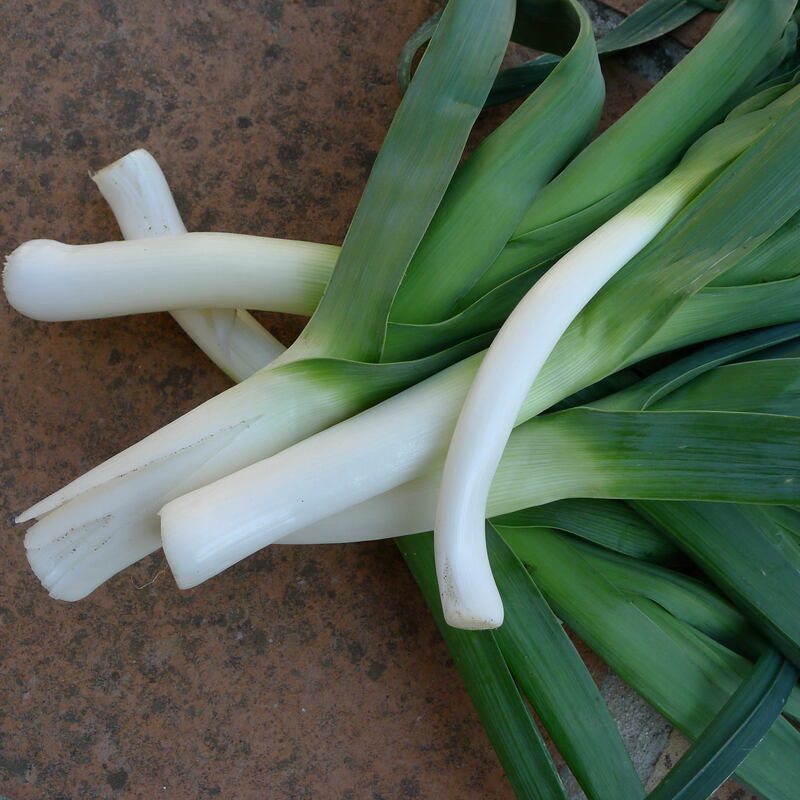 I love leeks prepared in that old-fashioned French dish, leeks a la grecque. The leeks simmer in an aromatic mixture of vinegar and olive oil and are left to cool in the broth, to be served atop greens as a salad course. 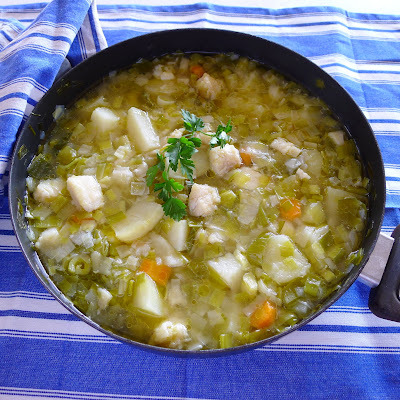 There’s always vichysoisse, a leek and potato soup. 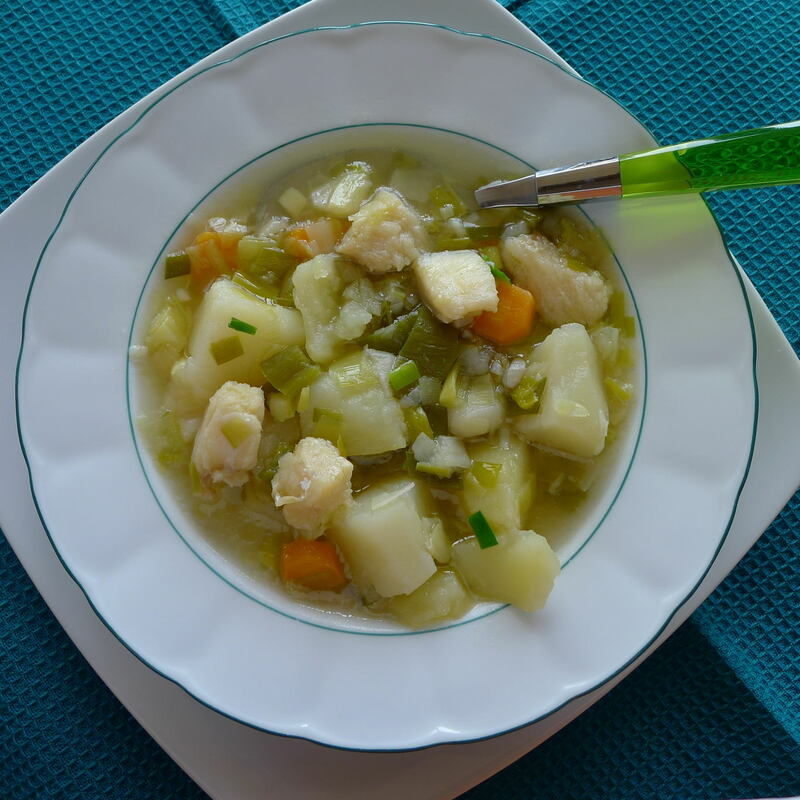 That trail led me to a home-style Basque soup, porrusalda, leek and potato soup, often embellished with salt cod. Lush with leeks, the soup is not pureed as is vichysoisse. Olive oil, not cream, gives it richness. Some cooks add carrots or pumpkin as well as potatoes. I like a sprinkle of hot pimentón (paprika) to punch up the flavor. 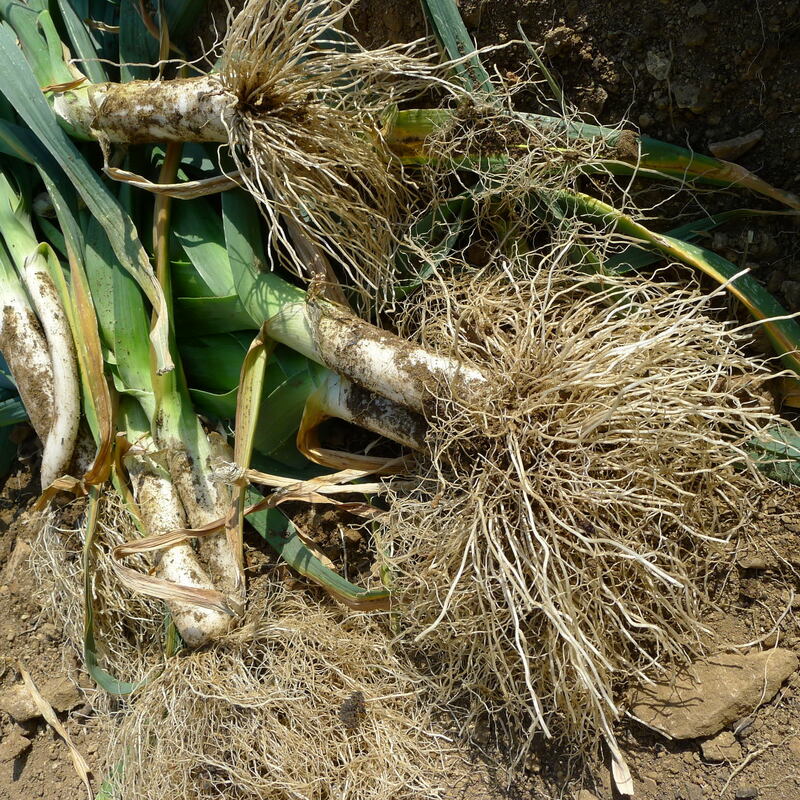 Leeks collect dirt between the multi-layered leaves. The best way to clean them is to slice downward from the tops and spread the leaves open under running water. Strip off and discard any leathery outer leaves. Porrusalda is Basque leek and potato soup with salt cod. If using the cod, put it to soak in water to cover 36 hours before preparing the soup. Cover and refrigerate. Change the water twice daily. Drain and rinse the cod. 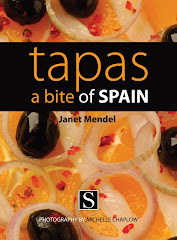 Cut it into bite-size pieces, discarding any skin and bone. 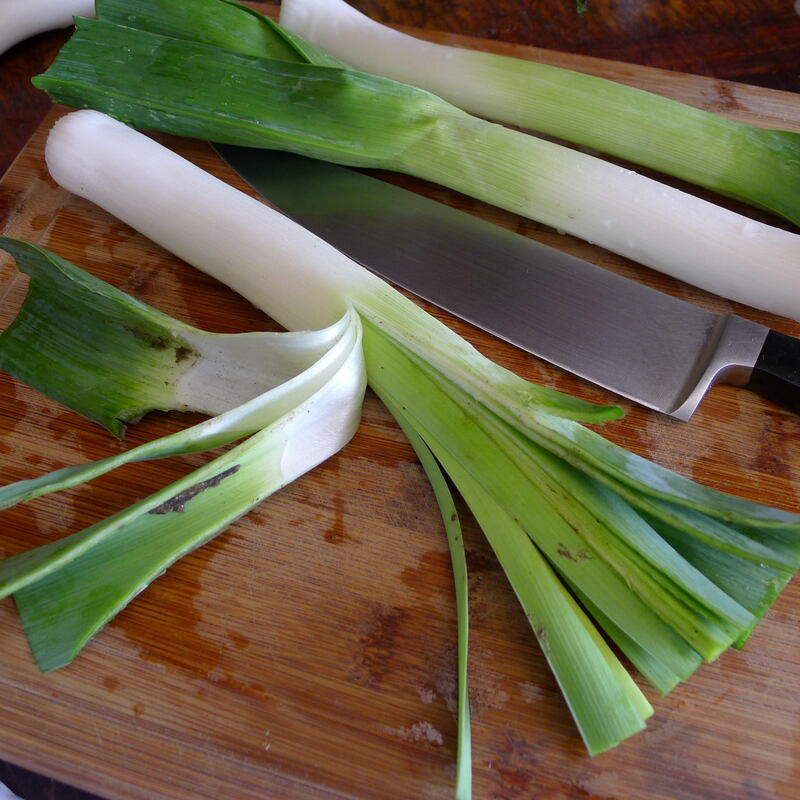 Split the leeks lengthwise and wash them well. Slice them crosswise (making approximately 5 cups of sliced leeks). 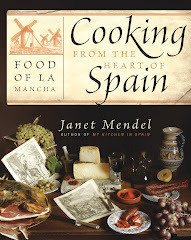 Heat the oil in a cazuela or soup pot. Add the sliced leeks, carrot and garlic. Sauté 3 minutes. Peel and cut the potatoes into bite-sized chunks. 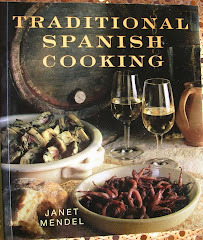 Add potatoes to the cazuela with water or stock to cover. Bring to a boil, lower heat to a simmer and add the pieces of cod. Cover and simmer for 20 minutes. Taste for seasoning, adding salt and pepper. Simmer another 15 minutes until potatoes and leeks are tender. Sprinkle with hot pimentón before serving. 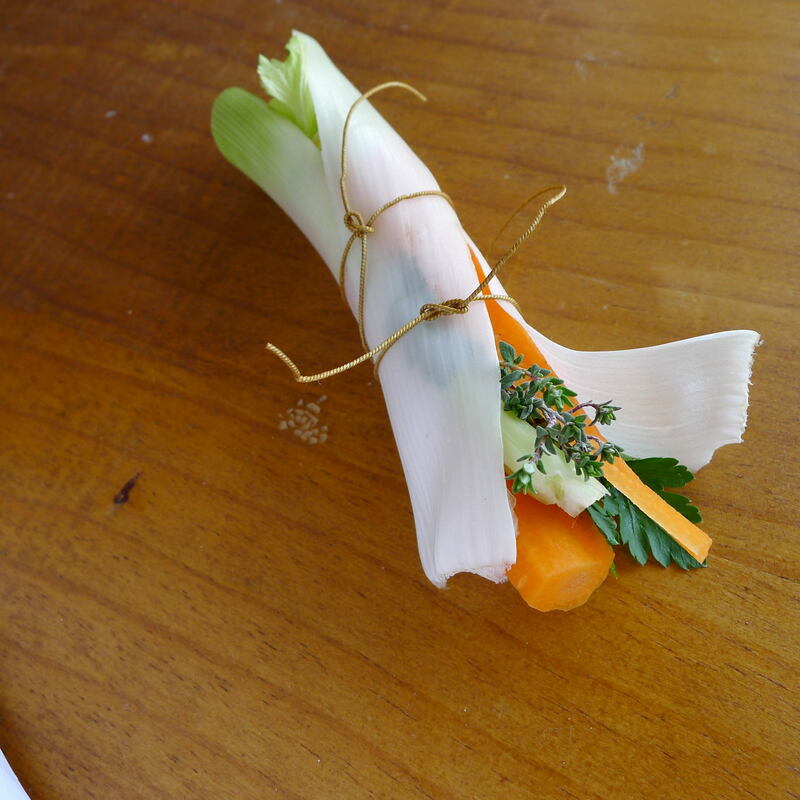 Here’s a tip I learned from a television chef: use the outer leaves of a leek to wrap up a bouquet garni with carrot, celery, parsley and thyme. Jacqueline:You're welcome. Always good to have a new way with leeks. 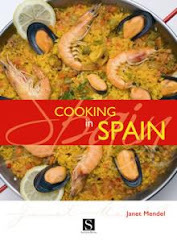 When I get back to Spain, I'm making this! I love leeks. They're so expensive in the States. Kaley: I had no idea leeks were an expensive ingredient. All the more reason to plant them in the garden. I'm going to try shallots next. Leeks are not that expensive in NYC - about $2.99 for a bunch containing 3 big leeks and weighing a little over 2 lbs. Definitely enough for this recipe, which looks fantastic! I bet this is fine with water instead of stock. Which did you use, Janet? 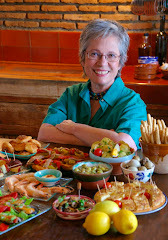 Donna: I used water, not stock, and it's delicious, especially with the flavor of bacalao.